"Mark's Airbrush Artism: Award-Winning Custom Paint, Airbrush, Pinstriping, "
""REVVED-UP!" 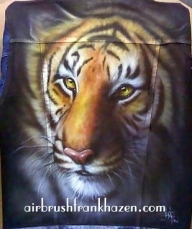 (C) 2010 Jon Hul This is my airbrush painting, rendered with acrylic paints on illustration board. The model is Denise Milani, and the car is a 2009 Fort-GT Custom." "Harley Davidson Tank Giger Skull design"
"Eisenhuth Graff-X - Airbrush - Übersicht"
"Thanks King Turner and Staff appreciate you"
"Guitar Kustom Airbrush by C.Fraser"
Hey Craig How is it going buddy? Mi dispiace molto....era un Personaggio molto conosciuto nella Kustom Kulture. Molto bello,se tutta la moto è fatta così è straordinaria! Look easy..but it is not! Awesome helmet! Yes, it was a lot work! Thank you! One question: for how many hours you work on this car?